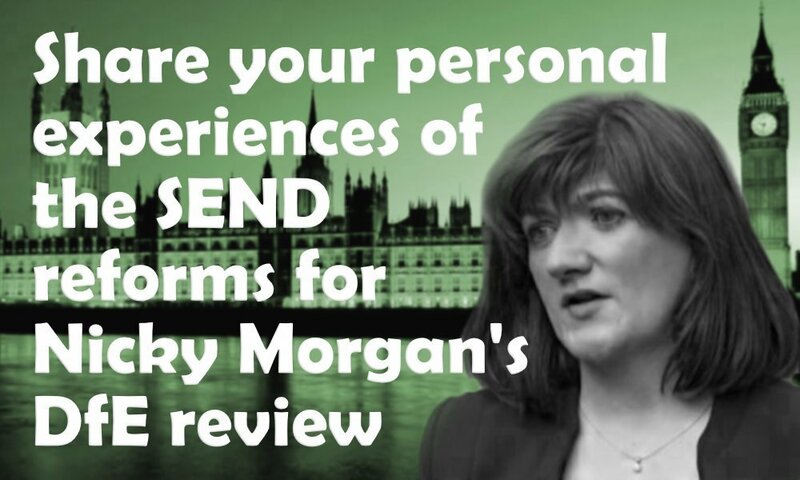 In just over a week's time, I'm taking a group of parents to the Department for Education to meet former MP, Lee Scott, who has been asked by the Education Secretary, Nicky Morgan, to carry out a review into the SEND reforms. Mr Scott has a history of being involved in autism and special needs and is Patron of the UK Autism Foundation. He's been appointed to gather views, especially of parents and young people, and to focus on schools and colleges. The evidence he gathers will form a report for Mrs Morgan. He already has lots of recent evidence from several quarters including Amy Skipp's research and the recent EHCP figures. He's speaking to other groups of course, but SNJ has been asked to bring some parents to meet him for a round-table session. Mr Scott wants to hear the different experiences of as many parents as possible, so I'm asking you today to send your recent experiences of the new SEND system using the form below. Would you like to come too? The session is being held at the Department for Education in London between 12:30 and 2pm on Thursday 16th June. I have some parents who have already agreed to come, but it's just not possible for me to know every special needs parent in England, so I'm hoping that someone (mum or dad) who hasn't had an opportunity to have their voice heard, can come along too. So, as I have one more space, if you would like to come and you are free on this date, at these times and are able to get yourself to London and back, (standard-class travel expenses will be reimbursed by the DfE), please indicate on the form tick box. If you do want to put a bid in to come along, you need to be quick, as I will select the person and let them know by email by the evening of Friday 10th June, so they have time to make any arrangements needed. My criteria will be someone who doesn't already have an active voice via a parent carer forum or a charity (as they already have lots of routes to put forward views). You don't need to be big on social media, but it's also fine if you are, it doesn't matter. You have until midnight 14th June to send your experiences in so I have time to print and collate them. All experiences are welcome, whatever they are - AND - why not include any ideas you have that could improve things as this would be extremely useful. Advocates and practitioners are also welcome to submit their experiences. Note: The Labour party also has a review underway, so you could always submit your views there at the same time - write them once and paste them here and to Labour's review!